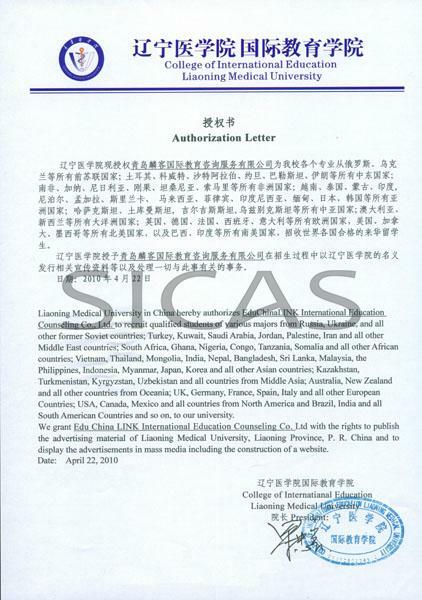 Liaoning Medical University is recognized by WHO and the graduates of MBBS program are eligible to take the Medical Licensing Examinations held by the medical councils in different countries such as MCI, PMDC, USMLE, HPCSA, SCHS etc. Human Anatomy, Histology & Embryology, Medical Psychology, Cell Biology, Microbiology & Parasitology, Immunology, Pathology, Medical Genetics, Pathophysiology, Pharmacology, Epidemiology, MedicalImageology, Ophthalmology, Pediatrics, Infectious Diseases etc. View the Syllabus for MBBS Program.pdf(it may be revised in the teaching process). The internship is arranged in the sixth year and lasts for 1 year (at least 48 weeks). Students can choose to do it in China, their home country or any other country. Generally, the internship is arranged in the First Affiliated Hospital of LMU, which is a large and morden hospital with 56 years of history. MBBS Degree: On completing the requirements of the teaching program and passing the graduation examinations successfully, international medical undergraduates will be granted a graduation certificate and conferred a medical degree by the host institution, if they meet the degree regulations of the host institution. The English copy of the degree will state MBBS (Bachelor of Medicine and Bachelor of Surgery). 1. Minimum a high secondary graduate with good health and no criminal record. 2. Applicants must have passed Grade Twelve (10+2)/FSc./A Level or equivalent. 3. Minimum age 18 years. Maximum age 30 years.